Mermaid Art & Jewellery Designs by Anne-Marie Broughton. Mermaid gift shop & mermaid coastal island home décor. 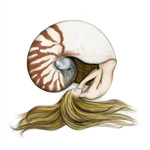 Mermaid pencil drawing art prints, mermaid paintings, hand painted mermaid art jewellery bracelets, mermaid shell pendants & mermaid boxes. Mermaid paper tails birthday party costumes & dress ups. MADE IN AUSTRALIA.